Robert Downey Jnr. 's built in charisma coupled with writer/director Shane Black's inherent Whedonesque talent – not to mention jaw-dropping and utterly invisible FX work – all come together to make IRON MAN 3 sing. going to make a shape, we're going to make a stew, that can be fun." In my review of The Avengers, I said "...if we really have to have enormous, ridiculous, Hollywood, bloated fare then let's please have Joss Whedon's enormous, ridiculous, Hollywood bloated fare." Let's add writer/director Shane Black's name to that limited roster of talent. Kudos is also due to Black's co-scribe Drew Pearce. Black seems to have done almost exactly what Whedon did; significantly smarten up the usually drastically dumbed down. Iron Man Three (the on screen end title eschews the numerical) is an absolute blast, a full on action behemoth interspersed with terrific character moments and expansions, one liners to savour, a light and throwaway wit and the greatest gift a blockbuster can be granted; the special effect that is Robert Downey Jnr. Let's not forget the overall timing inherent in the story that's just beat perfect, scene by scene. I suspect that the movie that got Black the gig is a little seen wonder from 2005, the well received but criminally overlooked Kiss Kiss Bang Bang. That crime caper is concentrated entertainment with not one dud scene and a playfulness in the performances that is a continuous delight. Downey Jnr. and Val Kilmer have rarely been more charismatic and both bounce off each other and spark as if they've been great friends their whole lives. Having seen this movie a great many times (and again straight after Iron Man Three), it's no surprise that my expectations for the man in the iron mask were in the region of the clouds and for once, there was no disappointment. In one scene, coincidentally set in the region of the clouds, there was a real, palpable excitement and genuine edge of the seat thrills. I blithely thought that the Iron Man franchise would be a limited one. Let's face it, who or what could he fight? In the first movie, the bad guy is a bigger Iron Man (er... OK) and in the second (what could be new, fresh, off the wall, different?) it was many Iron Men. Yawn. When I learned the second sequel's villain was the mysterious Bin Laden inspired 'Mandarin' played by Ben Kingsley (more I cannot say) I zoned out a little and then in the trailer appeared lots of Iron Men again, I sort of sighed dejectedly. After any Transformer movie, any metal on metal action bores me rigid. But the building buzz was extremely positive. There is a term in cricket to describe a ball that spins the opposite way once it's released from a bowler's wrist-twisted arm – a googly. Well, the Iron Man Three trailer has all manner of googlies and the movie is significantly better than the trailer has led us to believe. It sells us the usual block-blustery booms, bombast, bomb blasts and baddies and then the movie itself delivers delicious reverses, sleight of hand and pure and delightful surprises time after time. We still have to ignore the impossible every now and again (human beings encased in iron are not impervious to death by falling and crashing to the ground) but on the whole the adventure is solid and carefully rations shell head's appearances allowing the movie to sit on Stark's more worthy shoulders rather than on his metallic alter-ego's. Plot-wise, a second sequel cannot stray too far from the action formula but it strays far enough to satisfy both the rabidly 'awesome!' spouting summer youngsters and those of us who enjoy a little bit of dramatic substance with our popcorn. The Mandarin is interrupting broadcasts on US TV and spreading anti-US rhetoric, making all sorts of threats. Tony Stark has post-traumatic stress disorder after the events of The Avengers (not even shawarma can counteract that) and tinkers his insomniac hours away perfecting and honing lots of high tech Iron Men suits. This alienates his lover and CEO of Stark Enterprises, Pepper Potts played by the glowing (in some later scenes literally glowing) Gwyneth Paltrow. A patriot to the core, Stark sends a message to the Mandarin via the media and lo and behold, the next thing he knows, he has bad guy helicopter-sourced rockets taking his beachfront home and relocating it to the bottom of the Pacific. Feared dead, he rebuilds himself and his hunt for the Mandarin brings him into contact with gene-fiddling super-bad guys. The plot is complex but can be effortlessly followed. That isn't a contradiction. It's just good solid craft and terrific film-making by people who respect their audience despite the dramatic and drastic limitations of the action blockbuster format. Shane Black became a player at the ridiculous age of 23 after writing Lethal Weapon purchased for a silly sum of money so has honed a specific skill in the buddy-buddy genre. He also has a knack for dialogue that often feels movie-dialoguey but it still remains intrinsic to the narrative. Tony Stark's and indeed Downey Jnr's quick fire mind and delivery are willing cauldrons to both Joss Whedon and Black's brews so in some ways the director-actor team ups were matches that were meant to be. Add to the fact that Black and Downey Jnr. had a relationship due to Kiss Kiss and we're up and running. Black wisely gives Stark many partners to spar with. The warmest and most satisfying is his potato-gun started relationship with Harley (a terrific Ty Simpkins), a ten year old who is on the receiving end of Stark's less than sensitive life advice. But his role is crucial to allow Stark to deal with his anxiety attacks and suit up psychologically if not literally in damaged iron man armour. 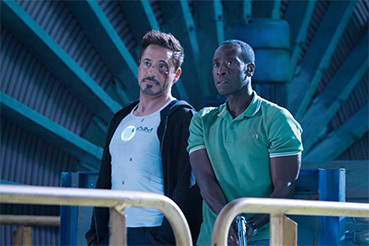 Don Cheadle, a very likeable and effective actor who can play nasty and saint with equal conviction has claimed the role of Stark's best friend, Rhodey, played in both previous movies by Terrence Howard. Who knows why the original performer was replaced? Encased in an almost satirically comical red, white and blue iron man suit, Cheadle cuts a dash (I wish I knew what that meant) as Iron Patriot, a sort of bespoke super hero for the White House born with the moniker, War Machine. Subtle. The visual and special effects (the latter is usually CG in post production, the former, physical effects shot in camera during principal photography) are utterly seamless. This is probably the 'perfection' that Black was talking about in the opening quote. They are so good that you never question the physical unreality of what you are seeing. 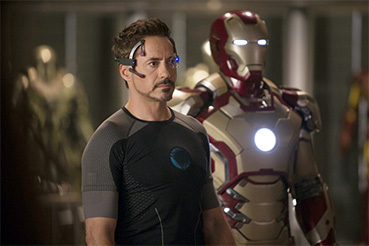 The Iron Man suits are now vehicles that Stark can step into, fall into, summon and leave parked outside a restaurant. And you smile as each method of suiting up reveals itself. The long distance summons takes a moment to register but when you realize what's happening, it's another big grin. The most extraordinary scene in the film – which I will not spoil – involves some very basic elements, so much so that in blockbuster action movie template terms it should be both tame and lame. The scene involves literally, thin air, fourteen people, with one of those encased in metal. You'll know it when you see it and if, like me, you appreciate cinematic virtuosity, you may even be wringing your hands dry at the end of it. There isn't one scene in the film that feels gratuitous. Not one action scene feels pre-scripted. Just a note to explain that... Most action films start with the idea of "Wouldn't it be cool if... (insert event)". Once you have five or so of these it's up to a competent writer (or usually a team of writers) to stitch them together to form a coherent story. So these are not stories that a human being ever wanted to tell... They are fairground attractions, spectacular 'wow' scenes that an executive committee thought would be cool to pour money into. Both Whedon and Black know the absolute importance of structure in movies (and screenplays) so despite the idea that both Avengers and Iron Man Three can be stripped down to one action sequence after another, they never feel that they are there for the sake of spectacle. They are all organic to the story being told. After all, it's all about story and this one's solid and enormous fun. "I try not to think of it as topping The Avengers. I try to think of this as its own movie. Sometimes yeah, I feel pressure and by the way, Shane – not helping! Iron Man 3 – not helping! Because I saw this and man, he really got it right".